He rocked you in 2012 with "The Little Drummer Boy" and "Silent Night." In 2013, he slayed you with "Jingle Hell." 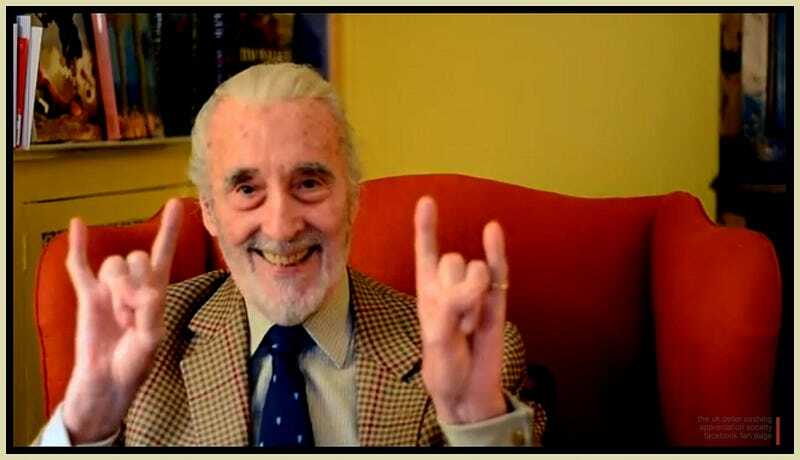 Now, Christopher Lee is back to melt the long, white beard off your face with "Darkest Carols, Faithful Sing," a "Hark! The Herald Angels Sing" do-over that contains the lyric "Glory to the metal king!" Last Christmas, "Jingle Hell" No. 18 on Billboard, making him the oldest performer in history to have charted. The record was previously held by Tony Bennett. "At my age, the most important thing for me is to keep active by doing things that I truly enjoy. I do not know how long I am going to be around, so every day is a celebration and I want to share it with my fans," Lee said. He's 92! Also a vampire, a wizard, and a worshiper of the Wicker Man. Can't get more metal than that. Hat-tip to Johnny Ray Huston. Top photo via Underradiorock.com.